WELCOME BACK. Winston Churchill once said: “Attitude is a little thing that makes a big difference”. It’s not whether you get knocked down or not, the most important thing is whether you get up. Your way of life is everything. I later discover in my life that the longer I live on earth the more I know the impact of my way of life. Attitude to me is more Important than the facts. It’s more Important than the past. It’s more important than the education. It’s more Important than the money. It’s more Important than the circumstances or successes and what others people think or say to do to you. What it matter is that you have a choice to make every day concerning the quality you will hold for that day. You cannot change your past, or change the fact that people will act in a certain way, and you cannot change the inevitable. Example, if your guitar has one string instead of six, God is looking to see if you would decide to make music with the one string you have. That’s attitude. I’m quite convinced that life is 5% what happens to me and 95% how I react to it. You are in charge of your own attitude. Robert S. Kelly sang a song and said: “I believe I can fly, I believe I can touch the sky. I think about it night and day, spread my wings and fly away. I believe I can soar. I see me running through that open door.” Woow! That was wonderful. My wife use to say when God close one door, he open another. But I use to say when man closes one door, God opens a better one. Whatever situation you are facing, it is your way of life which will determine your height, how high you ride upon the winds of life’s adversity. 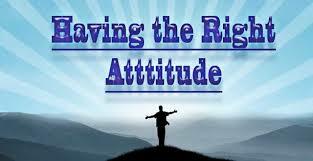 Your attitude is everything and God always blesses the right response then and now. The question is how is your attitude? The door is still open for those who look toward heaven. Through that open door, God reveals His purpose to you on a need to know basis. He shows you enough to make you realize that he is aware of your situation that he has a plan to prosper you and not to harm you. This entry was posted in success and tagged Consistent, Dream, Encouragement, Fulfillment, Growth, Habit, Imagination, improvement, Increase, Insight, inspiration, Journey, knowledge, Life Changing, motivation, Passion, Persistence, Personal, Possibility, Potential, Principles, Spiritual, success, Successful, Talent, Understanding, Vision, Wisdom. Attitude makes a big difference in our success and happiness. Thanks for sharing. I am grateful.. Thanks for your comment.. I love it.. See you again!! @ http://www.wizzymedpower.com. You will succeed! thanks so much for your concern… When that happens always click on the subject title to get “like” button! I appreciate… God bless you!